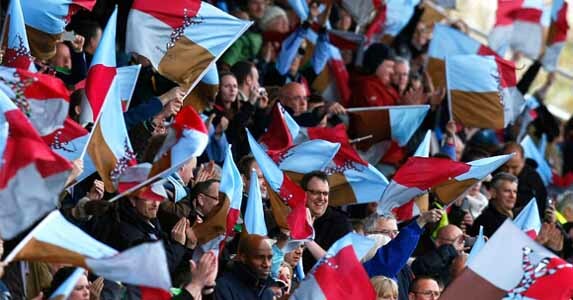 All smiles: Will Quins fans still be smiling after Saturday's game? THE FIRST of this weekend’s Aviva Premiership semi-finals will see Harlequins and Northampton battle it out at the Twickenham Stoop. Neither team has competed in a league final before, but nor are they strangers to knock-out rugby, with both having competed in European finals last season. And having missed out on the latter stages of this year’s Heineken Cup, both sides will be fully focused on getting to Twickenham on 26 May. Last weekend’s round 22 games handed victories to both teams, but also cost Quins Danny Care, who picked up an injury against Sale. However, with England’s Lee Dickson in the Saints’ starting XV, who could be better to take him on than his brother Karl, who starts for Quins and also trained with England during the Six Nations. Northampton will be without Courtney Lawes and Tom Wood, both due to injury, while Dylan Hartley and Calum Clark are serving suspensions, while Quins are also missing winger Ugo Monye who is out with a hamstring injury. While Harlequins’ season has been a success story from beginning to end, with the Londoners finishing the regular season at the top of the table for the first time in the professional era, the Saints have been left playing catch up. They left it late to cement their position in the table’s fourth spot, with a victory over Exeter three weeks ago, and although they secured a bonus point in the final round of the competition their form has fluctuated this season. Furthermore, although they reached the semi-finals of the league last year and the year before, they have fallen at this hurdle each time, and Quins have displayed more of a cut throat, winning mentality this term. As well as the battle of the Dickson brothers, Mike Brown v Ben Foden, who makes his 100th appearance for the Saints, at full-back will be a fascinating contest. Furthermore, coming up against Tonga’uiha, Long and Mujati will be a good test for young England tourists Marler and Gray, who are joined by the Samoan Johnston in the front row. So far this season it’s one apiece, with Quins and Saints beating each other on their home patches , but the Londoners will be too strong for the Saints on Saturday, the first time they will have met in a semi-final. Quins by 5. 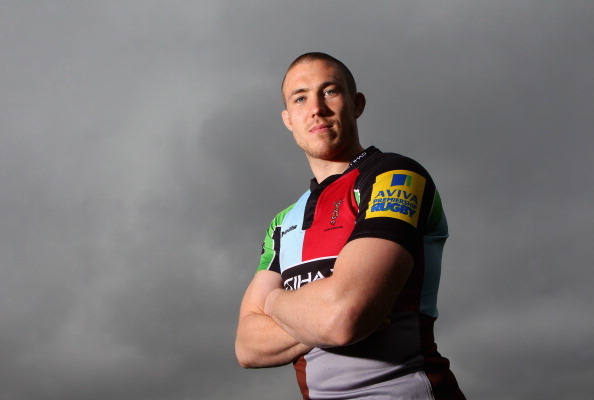 HARLEQUINS: Mike Brown; Tom Williams, George Lowe, Jordan Turner-Hall, Sam Smith; Nick Evans, Karl Dickson; Joe Marler, Joe Gray, James Johnston, Olly Kohn, George Robson, Maurie Fa’asavalu, Chris Robshaw (capt), Nick Easter. Replacements: Rob Buchanan, Mark Lambert, Will Collier, Tomas Vallejos, Tom Guest, Richard Bolt, Rory Clegg, Matt Hopper. NORTHAMPTON: Ben Foden; Chris Ashton, George Pisi, James Downey, Paul Diggin; Ryan Lamb, Lee Dickson (capt); Soane Tonga’uiha, Andy Long, Brian Mujati, Mark Sorenson, Christian Day, James Craig, Phil Dowson, Roger Wilson. Replacements: Ross McMillan, Alex Waller, Paul Doran-Jones, Ben Nutley, Teimana Harrison, Martin Roberts, Stephen Myler, Tom May. Click below to see a day in the life of a Harlequin!